The idea of organizing a Computer Graphics Show at Wheaton College in the spring of 1975 first came to me when I read an article on Norton Starr's work. Norton teaches mathematics at Amherst College, where my husband was then teaching geology. I had several discussions with him, and he was able to make numerous suggestions on important people in the field of Computer Art. He also demonstrated the use of the computer to generate and execute a design. I began to do a lot of reading on the subject, and eventually put together the show. Initially I had intended for it to focus on work being produced in New England (to help control transportation costs) but the exhibition eventually grew to include work from throughout the country. In my catalogue introduction I wanted to avoid a lengthy description of computer techniques, because I felt that these had been covered in other publications, and from a far more technical view than I, as an art historian, was able to present. Rather I had become aware during my graduate student years that mathematics had always played a very important role in works of art—certainly not in every painting or sculpture, but in a number of significant ones, especially during the late 19th and early 20th centuries. So in the catalogue I aimed to discuss computer graphics not as the products of complex machines unique to the modern age, but as related to a long standing interest in, and preoccupation with science and mathematics on the part of artists—particularly artists who sought to create visual images based upon some sort of universally valid order. The following is my introduction to that catalogue. The woman's confusion, amusing as it may be, was not without foundation. For Georges Seurat, chief innovator of the new style, had transformed the loosely applied brushstrokes and intuitively broken colors of Impressionism into a fabric of tiny, uniform, color-bearing dots which he repeated over the surface of the canvas with machine-like regularity. By dividing his colors in this calculated manner, he attempted to apply in painting the optical laws described in modern scientific studies of color such as Ogden Rood's Modern Chromatics (French ed., 1881) and M.E. Chevreul's De la loi du contraste simultane des couleurs (1839). Other scientific principles also intrigued Seurat. He followed the latest experiments being conducted on mental patients to determine the psychological effects of linear movement and of color, and he attempted to apply the results of these studies in his paintings in an effort to evoke a particular mood in the viewer. His attempt to elucidate a permanent structure underlying the ephemeral surface appearances which so delighted the Impressionists, occasionally led Seurat to construct the composition of a painting or a drawing according to the mathematical ratios which defined the ideal proportions of the golden section. All of this was in pursuit of an allusive 'scientific esthetique' described by his friend Charles Henry (1859–1926), who lectured and published prolifically on mathematics, psychology and aesthetics. The emergence of the first digital computers in the early 1940's opened up the possibility of pursuing a scientific aesthetic along lines more appropriate for an era of space-age technology. This, of course, did not happen overnight, and the computer remains, to a great extent, a scientific tool rather than an artistic medium. Yet by the mid-sixties the boundaries had become less clearly defined. 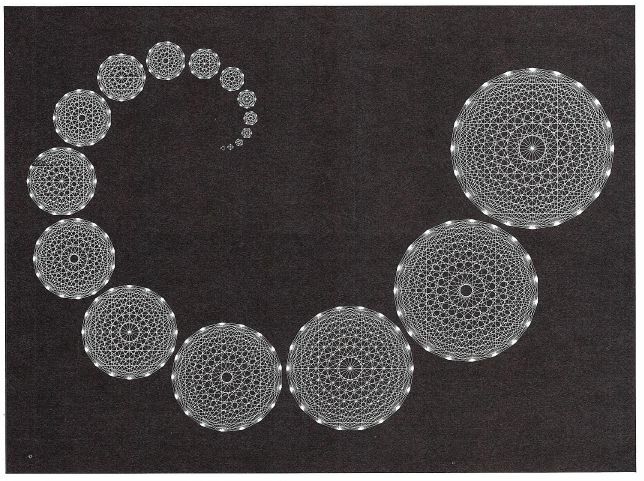 Occasional investigators who had begun by using the computer to obtain information in the form of plotted diagrams quickly realized that their 'scientific pictures' often had considerable aesthetic merit in their own right.2 Before long a number of mathematicians and engineers had begun to explore these aesthetic possibilities apart from any scientific objectives. Drawings produced with the aid of the computer made their way into fashionable New York galleries, and 1968 saw the first major international exhibition of computer art, 'Cybernetic Serendipity,' held at the Institute of Contemporary Arts in London. At the present time the computer is being utilized by graphic designers, printmakers, sculptors, film makers, architects and choreographers. Many prefer to work in conjunction with a programmer who can translate their ideas into the mathematical language of the machine. Others have learned to program their ideas directly, thereby maintaining an immediate involvement with their medium as has been the case in more traditional forms of art. The creation of a two-dimensional computer-generated design requires a number of steps.3 First the artist must state his idea in terms of a program, which is typed onto punch cards and fed into the computer. On the basis of these instructions (known as 'software') the machine (or 'hardware') computes the coordinates of the desired points. It is possible for the artist to program random as well as ordered elements into his prospective design, and to combine them in whatever proportions seem aesthetically effective. The range of possible effects extends from abstract geometric patterns to illusionistic landscapes. In the more sophisticated systems a visual image first materializes when a beam of electrons connects the points by a series of straight lines which it successively 'draws' on the screen of a cathode ray tube (CRT). At this stage of its realization, the picture appears as a white pattern on a dark ground, and looks as if it were being viewed on an ordinary television set. This provides the artist with an opportunity to correct errors or to otherwise modify his design before recording it on film or reproducing it in graphic form. When satisfied with the visual effect as it appears on the screen the artist may choose to have it photographed by an interconnected camera, or alternatively, he may instruct the computer to have the picture mechanically plotted onto paper in black or colored inks. It is also possible to introduce color to a drawing via standard silkscreening techniques. Computer-generated graphics have affinities both with the drawing and printmaking media. Like drawings executed by hand, the image is applied in ink directly onto paper. But unlike a traditional drawing, which is one of a kind, the computer picture can be reproduced any number of times by re-running the program and replotting the results. In this respect it is more closely related to a lithograph, in which the original image is drawn onto a lithographic stone and then multiplied by printing onto paper. It should, however, be pointed out that replotting a computer design does not insure an image identical to that in the initial drawing. The mechanical plotter can lose its orientation, thereby producing a strikingly different effect which may have aesthetic merit in its own right. It is also possible for the pen to run dry temporarily, creating random patterns of linear activity versus void on the surface. In some instances these too can yield aesthetically pleasing results which the artist may choose to exploit. If graphics, films and even three-dimensional sculpture created with the aid of computers seem like the epitome of a scientific aesthetic, it is precisely their mathematical predictability which often prevents computer-generated designs from being accepted as legitimate art. As A. Michael Noll has pointed out,4 intuition has always been a valued component of the creative process, and there would seem to be little room for an intuitive response on the part of the mechanical plotter taking its orders from a program in which everything is specified in mathematical terms. 'Archimedean Spiral' by Norton Starr, 1973. The print is a photo reversal of a black ink drawing on white paper. It is in the Wheaton College collection, Norton, MA. For many the computer seems not only to limit the artist's intuitive response to his own unfolding creation, but also prevents him from leaving any personal trace in the execution of the work. Granted he can devise a program uniquely suited to a particular artistic conception, and can accept, reject, or modify the image as it emerges on the screen. He can even vary the quality of line and introduce a variety of coloristic effects. Yet somehow all this seems limited when measured against an 'old master' drawing, in which every line and every nuance directly reflects its creator's individual response to the medium. However, to consider computer-generated graphics in this light is to remove them from their proper artistic context. Like so many 'conceptual' works of the past several years, the creative process is centered not in the execution of the work, but in the artist's mind as he conceives the idea for a piece. In fact, it is often the all-important idea rather than the individual's technical mastery of a particular medium which constitutes the success of a painting or a sculpture. The realization of the artist's mental image can even occur without his physical involvement, or even his presence, as evidenced by reputable sculptors who send their specifications to the foundry (jokingly dubbed the 'sculpture factory') where the piece is executed. Viewed in this context the computer should be considered not as a gimmick but as a tool capable of freeing the artist from tasks which otherwise would prove tedious or even impossible to accomplish by hand. In many respects the utilization of the computer for artistic endeavors parallels the emergence of photography as the 'mechanical medium' of the nineteenth century. In its early days many painters felt threatened by the camera's ability to reproduce a scene with greater verisimilitude than was possible by means of brushes and pigment. However, those painters confident enough of their own superiority over the machine quickly began to regard the camera as a valuable tool for recording the physical characteristics of a person, place or object in a form which could be consulted easily for future reference. It is not surprising that both Eugene Delacroix and Gustave Courbet occasionally worked from photographs rather than from live models, or that Paul Gauguin drew on photographs for the artifacts depicted in some of his Oceanic scenes. Only after the photograph was accepted at the level of an artistic aid could it ultimately cease to threaten painting and develop into a creative medium in its own right. Much of the computer-generated graphic work to date must properly be considered as the groundwork for a similar type of development toward an autonomous artistic medium. The first decade of experimentation has shown that the computer can be programmed to simulate the styles of previously existing art. As one might expect, it is well suited to designs which are basically linear and geometric, but by using a special program initially developed by Ken Knowlton of the Bell Telephone Laboratories, it can also reproduce tonal gradations. Other programs allow it to execute original designs in an amazingly free-hand manner, or to draw complicated buildings and their landscape settings in perfect perspective. One senses, however, that the machine's potential as a tool for creating completely new forms of art has hardly been tapped, although its obvious value in the fields of architecture and commercial design has already been acknowledged, and it is currently being utilized in highly creative ways by respected filmmakers like Stan Vanderbeek, John Whitney and Lillian Schwartz. The value of the computer for artists lies not in its ability to mimic what man can do, but in providing a means for man to accomplish artistic endeavors which ordinarily would lie beyond his technical scope. It is almost impossible to imagine what art lovers can expect from the computer in the future. In discussing its artistic consequences, A. Michael Noll has predicted the development of special 'programming languages' which could be geared to the requirements of any individual artist, and which would eventually become "as natural to use as the conventional brushes and oils. "9 If Noll is correct, and if more and more artists learn programming techniques in order to realize their ideas directly without the programmer as middleman, the concept of a bona-fide computer-based 'scientific aesthetic' may begin to seem less foreign. 1. Robert L. Herbert, Neo-Impressionism, exh. cat. (New York: The Solomon R. Guggenheim Foundation, 1968), p. 14. 2. Herbert W. Franke, Computer Graphics—Computer Art, trans. Gustav Metzger (London: Phaidon, 1971), p. 59. 3. A. Michael Noll, "The Digital Computer as a Creative Medium," IEEE Spectrum (October 1967), p. 90. 5. Roger Allard, "Die Kennzeichen der Erneuring in der Malerei," in Der Blaue Reiter, ed. Franz Marc and Wassily Kandinsky (Munich, 1912); new edition with documentary notes by Klaus Lankheit (Munich, 1965), pp. 77–86. 6. Wassily Kandinsky, Über das Geistige in der Kunst (Munich, 1912); English edition: Concerning the Spiritual in Art, trans. Ralph Manheim (New York, 1947), p. 73. 7. Wassily Kandinsky, "Über die Formfrage," in Der Blaue Reiter, p. 173. 8. Sixten Ringbom, "Art in the 'Epoch of the Great Spiritual': Occult Elements in the Early Theory of Abstract Painting," J Warb, 29 (1966) p. 416. 9. A. Michael Noll, "Computers and the Visual Arts," Design and Planning 2, ed. Martin Krampen and Peter Seitz (New York: Hastings House, Publishers, Inc. 1967), p. 79.